Optically Collimated - This means the display is focused at infinity, so the driver does not need to refocus his eyes from the road. The display looks like it is floating in space right where the road is. Most third-party HUDs are not collimated. Utilizes a Combiner Glass - This specially-coated piece of glass allows for virtually seamless viewing of the outside road simultaneous with the display, as opposed to cheap "reflective films." Go here and download the code, then open it with the Arduino program, connect your Arduino to your computer, and upload the code. 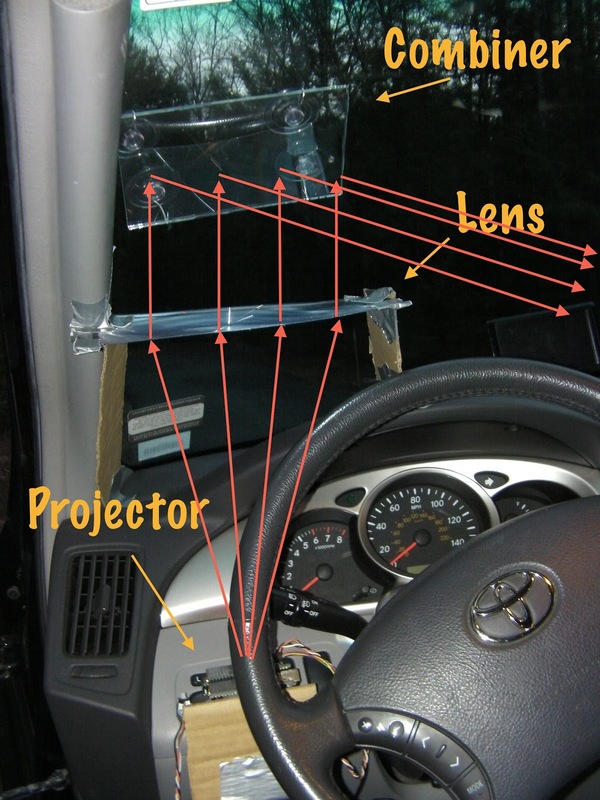 Pick a place in your car to build the holder for your Arduino. Keep in mind that it should be about 10 inches away from the lens, and it should be out of the way of your hands and legs when you drive. Duct tape and cardboard are extremely cheap materials to use, and they hold up pretty well. Next, put the Arduino on top and connect it to the OBD wires. I soldered headers onto my protoshield for easy connection with the OBD wires. Angle the glass until you can see the reflection of the display, then tweak the suction cup hooks to hold the glass in that position. If the suction cups hooks aren't long enough, just cut out a segment of a wire clothes hanger and bend it around the suction cup. After you finish, you might want to pull on the glass a little bit to make sure the suction cups will hold. The fresnel lens is very flimsy by itself, so I recommend taping some support around the edge. You can use cardboard, popsicle sticks, or anything you find around the house. Wooden kabob sticks worked well for me. Look through the combiner glass and through your windshield at an object far away (let's say a tree). Notice how when you focus on that tree, the display splits into two images because your eyes are no longer focused on it. Now place the lens right over the Arduino and then slowly move the lens up towards the combiner. Still focusing on the tree, you should see the two images of the display gradually get closer to each other. When the two images meet, stop moving the lens and mark its position. That means that the display is now focused at the same location as the tree. Now build a holder with cardboard and duct tape to hold the lens in that exact position. The lens will probably be bigger than you need, so just use scissors to trim off some of the edges where it's not needed. You now have a working heads-up display. Go for a test drive to see how well it works, and email me at abnormalbill@gmail.com with questions or comments. Great info! Could I use an LCD backlight device in place of your Audrino board and have it focused at infinity? I did try using a little cheap LCD 16x2 character display, but it was difficult to get it to reflect well off the combiner. You can certainly try it, but I've had better luck with LED displays. Are there options for more automobile friendly glasses?..plastic combiners.. In terms of safety, the suction cups are very secure but the wire hooks are not as secure. The glass rattles a tiny bit when driving around sharp corners and such, which could turn into a long-term safety hazard. Admittedly, I didn't really think about safety when I constructed the glass mount, and my suction cup hook design could definitely be improved. I will say I am working on a HUD version 2.0 with a different design, so I will give some thought into long-term safety when designing the new combiner mount. I'll do some research into making the combiner glass more safe if it breaks, although I suspect that will increase the price significantly. As for plastic combiners, if they exist I don't think they would have the optical quality needed for this project. How did you power the arduino itself? From the car? Yeah, the OBD cable I used (http://www.arduinodev.com/hardware/obd-kit/) came with a VCC/GND cable so I draw power directly from the car. It works even when the car is off, which is why I had to get a power switch. and use a multimeter to find a a fuse in your fuse panel that comes on and off with your key, (usually one labled radio will work) stay away from airbag fuses! it is not a big problem to power the arduino controller as it accepts 5V and a lot of battery banks mostly out 5V. Yes, some sensors and controllers use 3.3V which presents problem but that can also be handled. Inspired I ordered a bluetooth obd device to connect to android torque app. I was wondering if a cheap real HUD setup could be developed connected with an android device. That ways we could project navigation on the screen too. Hi! From where is the setup reading the mph? The speed data is coming from the OBD-II cable. Do you think a Pico projector could be made to work. 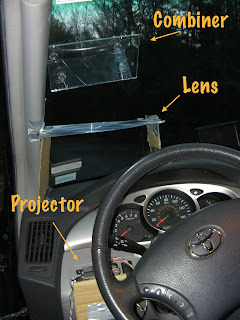 I was thinking of burying the projector in the dash pointing up at the windshield and using the glass as the "screen" to redirect image at the viewer. ? Hey Matt, early on in this project I looked at Pico projectors, but rejected them because of the cost. I am not sure how a projector would look on the glass combiner I used, especially when it's angled at a 45 degree angle, but you can certainly try it out. I am interested if you find more information on this! Would it be possible to use a cell phone as a projector instead of the 7 segment display (say for a GPS app) or do the complex LCD screen colors affect collimation? It's certainly possible, but you would have to make sure that the cell phone screen is mirrored (some apps can probably do that), and your lens would have to be A LOT bigger. I have not delved into using my smartphone because I already have trouble setting up the lens for a small 7-segment display. wow... really cool invention. is it really not hard to solder those wires? can I use any kind of display? This was my first soldering project. It wasn't terribly hard, but it took a little while to get used to. As you can see, my soldering job doesn't look pretty, but it still works. You can try any display you want, but keep it very small if you want the optics to work. Finally someones idea I can follow to get an HUD focused to inifinity! wow... really cool invention! What is the relation of lens focal lenght to its distance from display. Can I use my cellphone as projector with proper focussed lens with minimal distance? Is any way to speed up refresh rate? Did you face ghost image issue? If no combiner is used the image falls on windshield and it produces ghost image (2 images, coz the light is reflected from inner and outer surface of the windshield). Can it be corrected by a 50% window tint film? And does combiner totally eliminate ghost image problem? Very interested to know this as well. I am facing ghosting issues with the teleprompter glass. This thread is pretty old, but an important issue. If display is placed at focal point of the lens to collimated, then what happens when sunlight falls on the fresnel, won't that fry the display? Hmm, never had problems with sunlight frying the display, and I had it in my car for a couple months. Maybe if you live in a warm climate with lots of sunshine this could be an issue? Hi, thanks for the reply. I have bought a Chinese HUD and wud love to experiment with collimating the reflection so the need for a low focal length fresnel. But only issue is with strong sunlight a daily feature here in Mumbai, India sooner or later the hud will fry. Any advice hooking one of these up without an OBD2 port? Really awesome tutorial thanks! While I probably won't use this in the car due to form factor it is nevertheless an excellent science experiment at the very least. I have learnt a lot! By the way, is it possible to get a fresnel lens with a much shorter focal distance? Everything in this world has its pros and cons and that truely depends on our usage behaviour. Different gadgets and devices are made for a true happy weekend or spare time and should not be used so much that those devices ruin our social life. One should try to give pririoty to one's parents, friends and marital life rather than wasting time by excessilvely using these games or other devices. Hi I'm Bill Wong and I like making things.